UK-born Oliver Hart and Bengt Holmstrom of Finland have won the Nobel economics prize for work on contract theory. Judges said their work laid "an intellectual foundation" for policies in areas such as bankruptcy legislation and political constitutions. The pair will receive 8 million Swedish krona (£744,652) from the committee. Mr Hart, who was woken with the news at 4.40am, said his first reaction had been to hug his wife and wake his younger son. Mr Holmstrom said he felt "very lucky" and "grateful". The Royal Swedish Academy of Sciences said that Mr Hart and Mr Holmstrom's work was "valuable to the understanding of real-life contracts and institutions". It also said it could identify "potential pitfalls in contract design." Working separately, the two created tools to help determine whether public sector workers should receive fixed salaries or performance-based pay, and whether providers of public services should be publicly or privately owned. Mr Holmstrom in particular is known for his research into how contracts and incentives affect corporate behaviour. The former Nokia board member declined to say whether he thought executive pay was too high these days, but commented: "My personal view is that [top executives' contracts] are too complicated today." 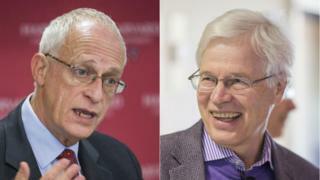 Mr Holmstrom, aged 67, is a professor of economics and management at Massachusetts Institute of Technology, while Mr Hart, born in 1948, is an economics professor at Harvard University in the US. The pair saw off competition from the World Bank's new chief economist Paul Romer, who was widely tipped to win. New York University's Stern Business School, where Prof Romer teaches, sparked controversy last Thursday when it accidently published a press release naming him as the winner. It quickly took down the release, saying it was only preparing for a possible win. Others believed to be the running included Olivier Blanchard, a former chief economist at the International Monetary Fund, and Edward Lazear, a fellow at the Hoover Institution, Stanford University. To date Americans have dominated the award, with 55 of the 76 laureates holding US citizenship, including those with dual nationalities. Last year Scottish-born economist Angus Deaton won the prize for his use of data to investigate income inequality and inform economic policy. It is the fifth Nobel to be announced this year, after prizes for physiology or medicine, physics, chemistry and peace were awarded last week. The Nobel prize for literature will be awarded on Thursday.